"Destined to be a Champion"
One of the game's all-time great guards, Clyde "The Glide" Drexler was known for his high-flying yet seemingly effortless swoops to the basket. After almost a dozen seasons with the Portland Trail Blazers, Drexler left Portland with his name all over the franchise's record books. 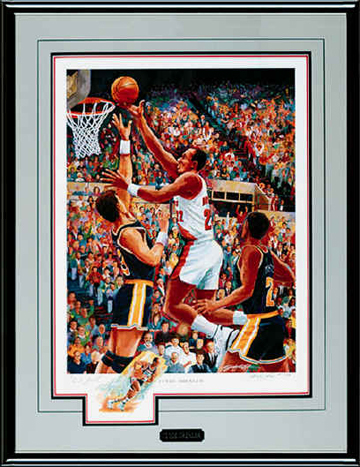 A perennial All-Star and a member of the 1992 U.S. Olympic Dream Team, Drexler twice led the Blazers to the NBA Finals. It wasn't until he joined the Houston Rockets however, that he finally earned a championship ring. A Masters Edition artwork, hand embellished by the artist. 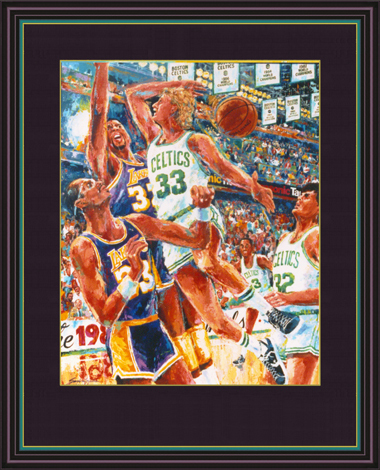 Depicting Larry Bird in the heat of battle with a dazzling behind the head pass. Bird's personal autograph is a special enhancement for this commemorative artwork of a legendary player. This unique and original multimedia artwork is for the art collector who appreciates the finest expression of the artist's style and technique. Holien applies texture and pure color with palette knives and brushwork over a Giclee foundation. After his original work on the canvas, it is mounted in a deluxe multi-profile frame with a fabric covered liner and a custom signature inset to display the personal autograph included with the painting. Lithograph size: 22" x 30"
Overall framed size: 30" x 37"
Edition size: 750 worldwide release, plus 100 Remarqued Artist Proofs.